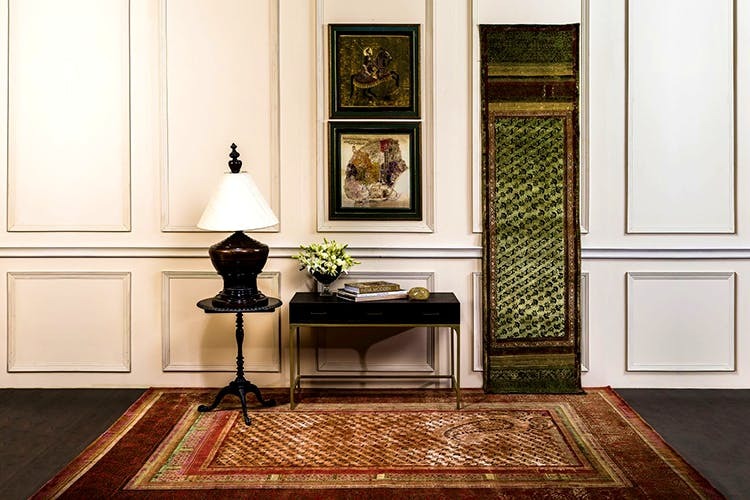 India’s fascination with carpeting is well-known and ages old, and in most homes, rugs are collectibles. Obeetee has been monumental in feeding this fascination. Founded as Oakley Bowden & Taylor in 1920, today Obeetee has gone on to grace the homes of none other than her Majesty Queen Elizabeth II and the President of India at Rashtrapati Bhawan. Their colour bank holds over 4,000 colour-fast shades of wool, and their weavers and designers are some of the finest in the world. Hand knotted in silk and imported wool, each one is unique in its patterns, colours and textures. Here’s where ace designer Tarun Tahiliani comes in; he’s added his signature touch to the newest designs. With fine zari threads being woven into these rugs to render a metallic lustre, to classic Indian motifs like Kairi bootis and floral patterns like lotus and rose, the Art on the Floor range is for all you collectors. The future of the concept will include several renowned fashion designers and bring forth Indian karigari at its finest. Art isn’t just for the walls, and art isn’t just paintings and sculptors—get in on the game and get your rugs right.